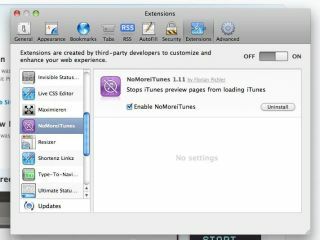 Apple has announced the addition of extensions to Safari 5, which add extra functionality to the company's web browser. The update, which goes under the official banner of Safari 5.0.1, allows users to download extensions that devs have been working on since June. Although you could already access some of the extensions by drilling into Safari 5's advanced settings, this new update makes it easier for the average user to find the extra functionality which is on offer. The Safari Extensions Gallery has already attracted a number of big names, including Amazon (who has adapted its wish-list app for Safari) and Microsoft who have now integrated Bing search into Safari with its web extension. Other names who have created extensions include the New York Times and Twitter. Explaining the Extensions, Apple notes: "Every Safari Extension is signed with a digital certificate from Apple to prevent tampering and to verify that updates to the extension are from the original developer." When it comes to privacy, the release is quick to explain: "Safari Extensions are sandboxed, so they can't access information on a user's system or communicate with websites aside from those specified by the developer. For increased stability, Safari Extensions run solely in the browser." To check out the extensions, go to extensions.apple.com.